Jan Dee ( left ) and Janet Gutrich have been partners since Dec. 17, 1994. They both support LGBT and AIDS causes as individuals and through their businesses. 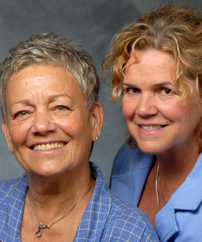 Jan Dee has been an openly lesbian business owner, with her Jan Dee Jewelry, since the 1970s. She served as an important role model for other business owners, both through being out of the closet, and also in giving back to the community. She is also a photographer and has documented many gay community events. Dee served on the board of Woman Care and volunteered with Horizons, Women's Treatment Center and the Lesbian Community Cancer Project. Gutrich is a chiropractor, health coach and wellness practitioner. The couple have been donors to, among others, the Human Rights Campaign, Horizons, Chicago Foundation for Women, Personal PAC, Astrea, the National Abortion Rights Action League, Designs for Dignity, Equality Illinois, Gay Games, Test Positive Aware and LCCP.